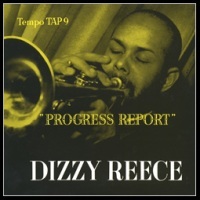 Description: Jamaican Trumpeter Dizzy Reece is perhaps best known for the three leader albums he made for the Blue Note label. But before he came to the U.S., he made some great records for the Tempo label in Great Britain. One of them is Progress Report, now available in great-sounding vinyl thanks to Atelier Sawano of Japan. Originally produced by Tony Hall, this album consists of three sessions. The session in December 1956, which produced four tracks in this album, included the British pianist who had already made a splash across the pond, Victor Feldman. Other two sessions alternately featured, in addition to the rhythm section, powerhouse tenorman Ronnie Scott and guitarist Dave Goldberg at the front of the band with Reece. Unmistakably, the star of the show is Reece's fiery and passionate trumpet playing. The performances are very strong, and the entire album is very effectively structured and sequenced. Thanks to the tender loving care of the people involved in this reissue project, the sound quality of this vinyl record is superb: Open, vivid, dynamic and detailed. Strongly recommended for vinyl fans! Originally produced by Tony Hall for the Tempo label. Recorded in England on April 26, July 23, and December 28, 1956. This reissue vinyl LP (mono) was released in Japan by Atelier Sawano in November 2008. You can listen to sample audio files here.